I’ve been chasing ghosts and rumors for a few years. I’ve heard the owl on several occasions, but usually not close. And on a couple of occasions very close; but then the bird went silent before it could be found. So this sighting was not only my first but also very special and rewarding. First some background information about this species. It’s a member of the Barn Owl (Tytonidae) family which has overall about 16 species in two subfamilies. 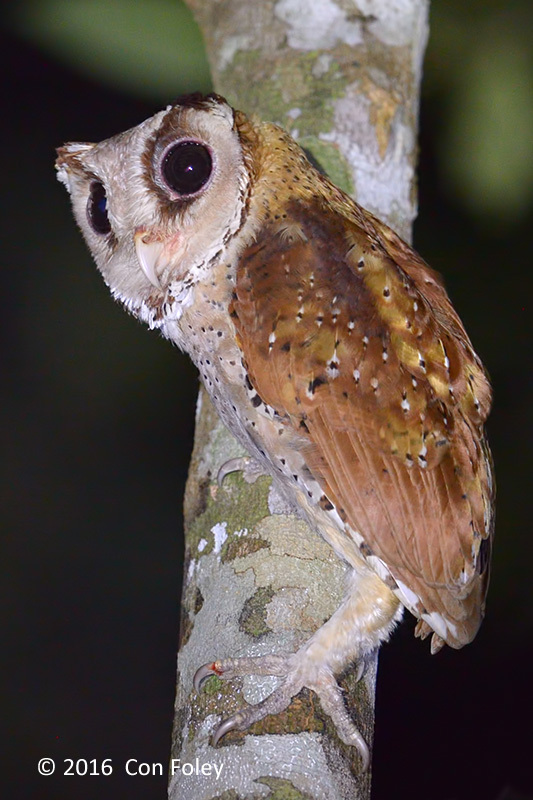 The Bay Owls are placed in the subfamily Phodililnae of which there are two or three species. 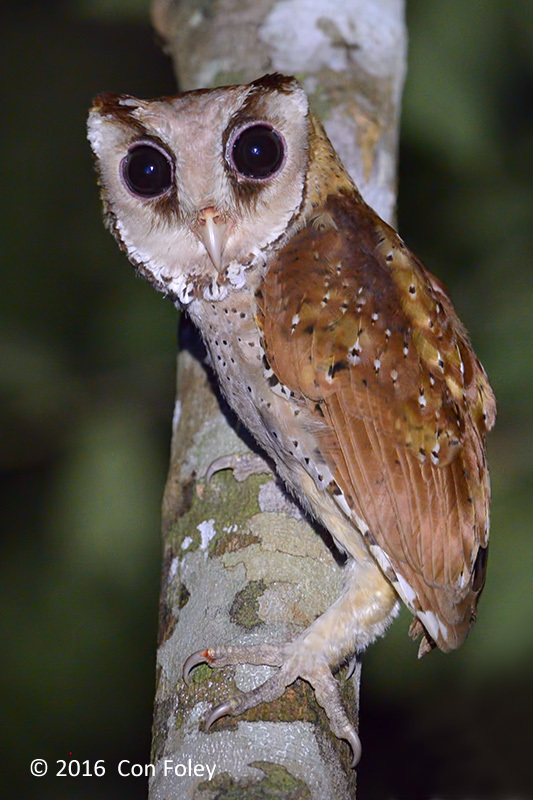 The Sri Lankan Bay Owl (Phodilus assimilis) is surely one, but the Congo Bay Owl (Phodilus prigoginei) is not as certain. All of these birds share a heart shaped facial disk which collects sound waves (Winkler 2015). A wide range from Assam (India), through to southern China, Vietnam, Sumatra, Borneo, Java and Bali. May have at one time existed in the Philippines. Voice (see Xen0-Canto) a loud series of complex rising whistles. Rare throughout it’s range although thought to be more common in Southern Peninsular Malaysia (Wells 1999). Commonest at low land plains level, although some sources say it’s preferred habitat is foothill forest between 200 and 1,000 m and submontane forest up to 1,500m (König 2008). Forests, forest edges, even plantations and landward edge of mangroves. With its very wide range and variety of habitats it is listed as Least Concern. About half the mass of a Barn Owl and shorter at about 23-29cm versus 29-44cm for the Barn Owl. Quite distinctive false ear-tufts, almost no tail, short but powerful legs with enable it to perch upright on vertical perches. This photo shows the false ear tufts, which no doubt help collect sound for its asymmetrical ears. On the lucky day, we found one that was calling at some distant in the forest. Having prior experience that this species will not ordinarily come out to greet you, we bashed into the forest about 100 meters. Of course it was pitch black except for our torch lights, and the secondary forest has lots of undergrowth, vines, rattan, thorny palms, fallen trees; so it was quite challenging to manage all of these obstructions and attempt to do so quietly as well! Fortunately on this occasion the owl obliged by calling well and repeatedly allowing us find the right direction. But he led us on quite a chase as he changed perch several times before he was finally spotted almost 30 minutes later. But once he was spotted he stayed in completely open view for at least 15 minutes, much longer than most owls can be observed. 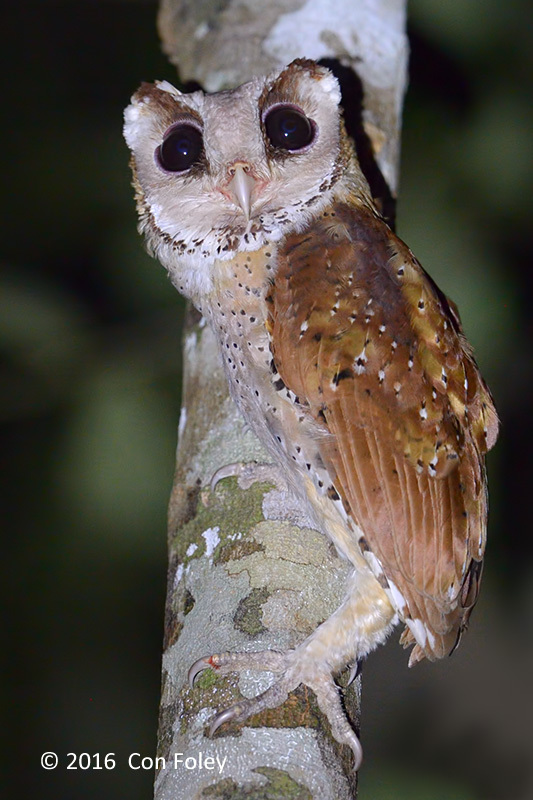 The owl was perched on small (in diameter) tree trunk about 7 meters off the ground. The manner in which the owl perched and the type of perch is similar to many images of this species. But for me it was a bit higher than I had expected, and the owl a bit bigger than I expected. Anyway, for those wishing to see or photograph this species, good luck finding one that calls long enough for you to track it into the forest (Jeyarajasingam 2012). It’s not likely to come to the forest edge, so you can leave your tripod in the car, and go in hand held. It’s not entirely clear but this species appears to have a fairly big range and moves around within that range, so will not always be at the same place. Notice the small amount of blood on its talon, so either this owl has injured itself, or perhaps more likely recently captured a prey. König, C.; Weick, F. (2008) Owls of the World. Christopher Helm, London. del Hoyo, J.; Elliott, A.; Sargatal, J. (1999) Handbook of the Birds of the World, vol. 5: Barn-owls to Hummingbirds. Lynx Edicions, Barcelona, Spain. Jeyarajasingam, A. (2012). Birds of Peninsular Malaysia and Singapore. Oxford, New York.